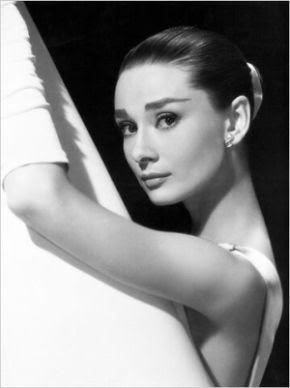 Bygone Brilliance: "Happy birthday to us, happy birthday to us..."
Today is Audrey Hepburn's birthday. Besides deserving a special tribute, there are a few things I wanted to say about Audrey that won't carry a post by themselves. First random thing is her eating habits. You still hear story after story about how she was anorexic, only to have those countered by tales of her ravenous appetite for pasta and chocolate. I am rather sick of it, because there is an obvious explanation. Hepburn had a few periods of major depression, a typical characteristic of which is a decrease or increase of appetite, and she both gained and lost large amounts of weight when she was experiencing them. Having no desire to eat a substantial amount is not the same as anorexia nervosa, although they can appear similar to an observer, especially one looking for a good story. From what I have read of Alexander Walker's Hepburn biography, her supposed bouts of anorexia were just that, bouts, and not a long continuous thing, supporting the idea that the only problem was clinical depression and she did not suffer from anorexia. What people assumed was an eating disorder was simply a symptom of mental illness. This is just a theory, but it seems logical to me. What say you? The other random thing was to say that Hepburn is the perfect example of how beauty is mostly determined by personality. If you look at her face, it is far from perfect, downright strange, but the feelings beaming from her eyes make Hepburn a sight to behold. Even if you took her eyes by themselves and gave them to someone else, that person wouldn't be beautiful unless they had the same "elegant spirit." I'll stop now before I get too philosophical, but you get the idea. Perhaps you needed a lift if you listened to me and looked at your nose from the side with a hand mirror. The title says: "Happy birthday to us" which brings me to another point. Today is my birthday as well: I am fifteen. Which feels straaange. Coincidentally, I had ordered several books and sent them to the US about a month ago and my sister came to visit yesterday bringing them, me having bribed her to do so. You can expect a ton of book reviews soon. One of the books, Making Faces, I bought in an attempt to teach myself how to apply makeup and I tried out some of the looks today after school--my dear, loving, supportive family asked me if I was sick, had swine flu, or had been aiming for the " dead bird" look. But they were joking--I hope. Happy birthday to Miss Hepburn! And gooooooo Tauruses! Happy Birthday Merriam! and Audrey! Don't worry about the makeup thing...practice makes perfect! I went through a weird phase in 7th grade with bright purple 'electric iris' eyeshadow and brown cateyes (eyeliner). Oy. Bad mistake! Natural is the prettiest, remember! Happy Birthday Merriam! How lucky that you and Audrey share a birthday! And ugh, 15??? You make me feel so old; I turned 18 in January. But anyway...read my post on Audrey's bday. And you're right, she wasn't anorexic. Accroding to Sean Ferrer, she was well proportioned, but almost starving to death during the war is of course going to lead to weight problems. But I can't say i agree with you about her face being strange, though I understand what you're saying. She had a different kind of beauty, but to me, it's that unusual face that makes someone beautiful. That's why I think she's the be all end all; but then again, I am biased! Never heard of Audrey being anorexic, just that she sufferred long-term effects of malnutrition from the war. I think if she were an anorexic, her arms wouldn't have been shown as often as they were (like Vera-Ellen in 'White Christmas'). "Chronic hunger and malnutrition can cause significant health problems. People who go hungry all the time are likely to be underweight, weighing significantly less than an average person of their size." Thank you to each one of you for all the birthday wishes! I really appreciate them. @Graciebird: Perhaps a better word would be "unique" or "unconventional". Maybe strange for her to be considered a flawless beauty when her face was so different from classical beauty standards. It is unfair, actually. When looking at pictures of Hepburn awhile ago, I noticed she actually looked better when the bump on her nose was visible. That isn't true of basically anyone I've met. @Sharon: That is another good point, that she didn't have any of the side effects of anorexia. I think people have exaggerated stories about her lack of appetite at times because they want to say things like, "It isn't normal to be thin like that; Audrey Hepburn was anorexic, so you shouldn't want your figure to be that way too." Seems like they're trying to find something juicy about AH rather than just admitting she was malnourished and sometimes depressed. And smoked a lot. Most of the anorexia stories don't come from reputable sources anyhow. @Millie: Really? How old are you? My dear child, East of Eden & Splendor in the Grass so happen to be on my list of favourite movies too - we share something in common! Audrey Hepburn, mentioned in your dispatch, I agree was one of the finest actresses of those bygone era's & one who revealed a little more of herself at each revelation. Natalie Wood was particularly admirable, in my humble opinion, in her lesser-known movies Inside Daisy Clover with Robert Redford & Love with the Proper Stranger starring a reticent Steve McQueen. Anyway, my dear, all the best with your energetic & fascinating magazine here!